I'm aware that since full white harness came to play, tabards and cloth-over-armor started to become rarer. My doubt is how, then, did the kings, princes and other high noblemen would be identified at battlefield both to their own soldiers as to their enemies, since they didn't would use, perhaps from a sparse minority, heraldic devices over their armor or at their shields. Did they were always accompanied by cavalry or infantry guardsmen with their own banners or the horses would still have heraldic devices over them (i.e. caparisons)? For the sake of example, I heard that Charles the Bold's household infantry were put to guard his personal flags; don't know if there was something similar to his figure. This one is aparrently late 15th century or 1500's, showing Kaiser Maximilian I as a dismounted men-at-arms. The zwëihander is quite odd for its time, though. 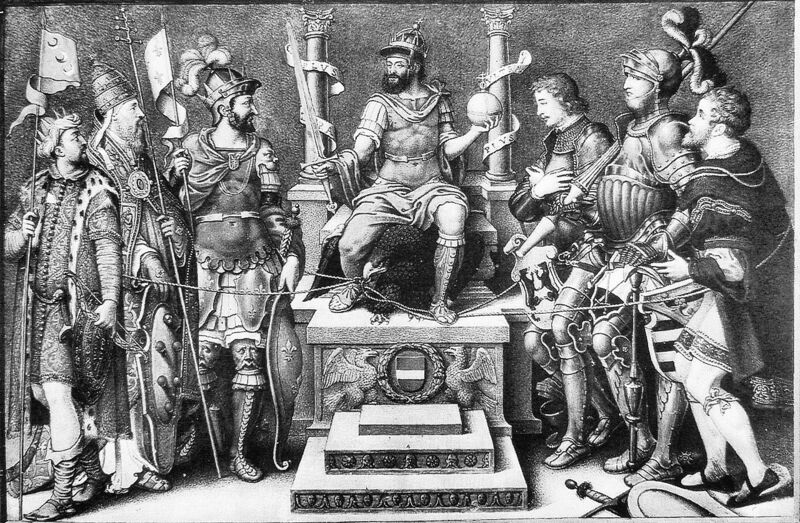 The nearest two figures at his left, in armor, are the Landgraf of Hesse and the Duke of Clevers (the one who married his daughter to Henry VIII). "1518 Altdorfer Sieg Karls des Grossen ueber die Awaren anagoria"
This is definitely not from the 15th century... it's attributed to Jan Swart von Groningen, who wasn't born until the 1490s. It's unlikely to date any earlier than around 1510, and the zweihander is consistent with that. Also I don't think there is anything to indicate that this is intended to portray Maximilian specifically - the British Museum describes this fellow as simply "a knight". If you observe some representations of the kings of France in battle/arms - Louis XII in Genova 1507, François I en Marignan 1515 or François I en Pavia 1525 - you can watch they wear clothes above their harness and horse armour. In some cases in the horse bard they were the royal flour de lys, like in Pavia, but his rival Charles duc de Bourbon also wear the flour the lys on his chest bard. In the 1535 Tunis campaign cartoons and tapestries - see atachment - you can see the Emperor leading the met at arms battle folowed by the imperial standard. The standard bearer was the count of Bossu, by the way. There are two men on foot following the Emperor on horse. They wear the characteristic yellow imperial livery "librea" of their body guard, and they are armed with short lances - or jinetas - and "rodelas" with Charles V mark: the Hercules columns. I think it could be a license of the painter to permit an easy identification to those who watch the tapestries, because it has no sense two men running between horses. I think that the soldiers that capture the jing of France in Pavia didn't recognize him at first. I'm sure that people who didn't live in court didn't know their kings. A lord magnificiently dressed could be confused with them. When Philip the Handsome came to Spain by sea there was a strong storm. Some people though they were going to sunk. Then, they give to Philip a floater made of a skin to be tied to the prince. In the float you could read "Rey don Philipe" in order to recognize the body if anyone could recover the corpse.